The face and especially the mouth must be approached with care and respect by the clinician who wishes to make positive changes in oral-motor function. 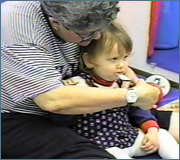 This video details preparation techniques and treatment approaches to achieve facial tolerance for stimulation and improve functional chewing and swallowing. Preparing the Oral-motor musculature, facilitating oral-motor organization and general treatment strategies are presented.